Liquid asphalt coating systems are ideal for a variety of roofing applications thanks to the high performance materials used. We use Centaur who are renowned for their innovative ‘moisture triggered chemistry’ that cures quickly to provide a highly durable finish. Our specialist team have full manufacturer training that enables them to apply the Centaur seamless roofing protection over asphalt roofing system perfect for a high performance finish. It’s extremely versatile so can be applied to asphalt, felt, metal, concrete and many more types of surfaces. Once it has been applied the liquid coating quickly cures to form a seamless, fully bonded flat surface that is resistant to rain. It is a cost effective roofing system as it required very little maintenance and, thanks to its durable qualities, you can be sure of a long lasting solution that provides the utmost protection against the elements. 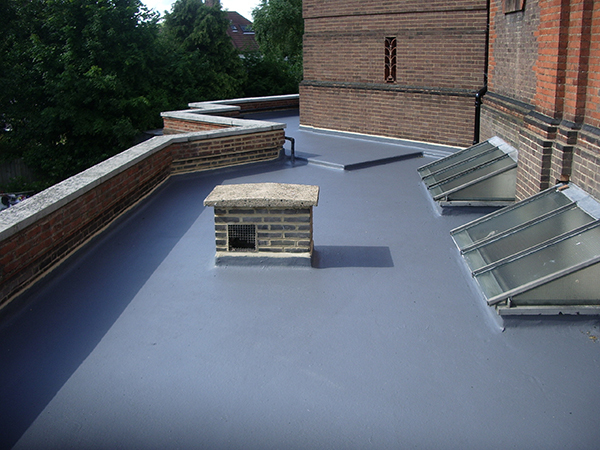 Liquid roofing systems can also be applied to older roofs in poor condition, giving them a new lease of life and saving you the cost of a whole new roofing system. Contact the team today to find our more about liquid asphalt roofing systems.